I am meant to be on a low-buy but I've wanted to try this brand for years so I was very, very bad and placed an order for a few bits. I chose four products to purchase and also got a set with three minis for free with my order. I definitely wanted to try the classics and - although Milk does offer skincare - the stick format of their serums didn't appeal to me massively, so I stuck to makeup products. The first thing I just had to try was the Blur Stick | £30.50. I decided I wanted to try the original but that if I loved it enough to use it all up and want to repurchase it, that I'd go for the luminous version next time. I did also get a mini of this in the free set, which I'll keep for when I'm travelling or give to a friend to try (in retrospect I probably should have gone for the Luminous in the full size!) This is essentially a stick primer - I personally don't mind this format because I use it in the morning on clean skin, minimising the likelihood of germs gathering on the surface. One thing that's a little annoying is that mine came slightly broken a couple of inches down from the top, which will be messy once I get down to it! Overall I really enjoy this primer - I simply swipe it on my skin and it instantly removes surface shine and definitely has that blurring effect. It glides right on, making it a great satin base for makeup. I have heard some people say it pills up on them; although I haven't experienced this much with the skincare and foundation combinations I've tried with the Blur Stick, I would recommend giving your moisturiser some time to absorb before using this and then letting the primer sit for a few minutes before applying your base. I'm seriously impressed with how my pores look when I use this; they're as smoothed as I think it really gets. This also helped stop my foundation from settling into fine lines. Overall I'm really impressed with how this made my complexion look! Lord knows, I really didn't need another concealer but I did want to give one of their base products a go so also picked up the Flex Concealer (Medium). This shade was more or less a total guess and my guess actually turned out well, by some miracle! Medium is a warm shade with a peachy undertone so both brightens and corrects under my eyes. The concealer comes in this little tube with a doe-foot applicator. 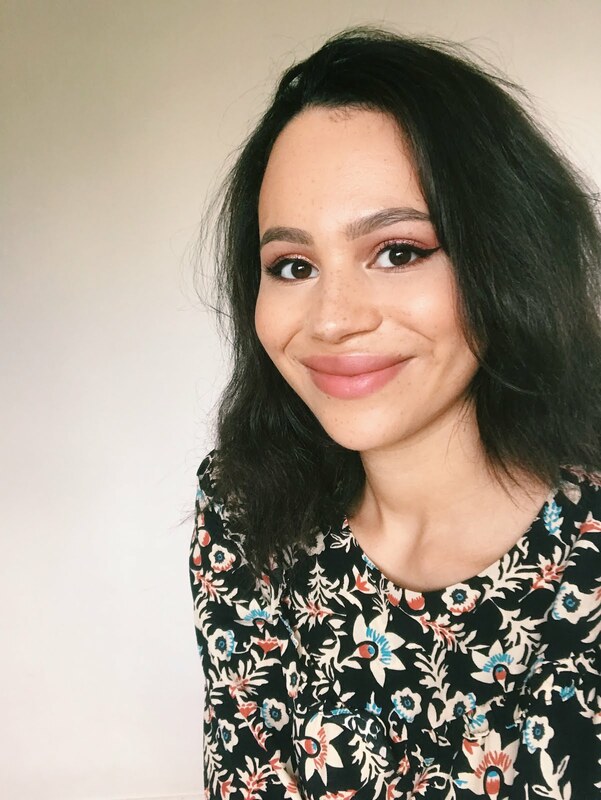 I really, really enjoy this formula - I'd actually say I prefer it to the Fenty one I reviewed recently! It doesn't have a matte finish but it isn't dewy and doesn't crease on me, which most concealers do at least a little bit. It somehow has really good medium-full coverage whilst feeling so lightweight on the skin. It also wears really well under my eyes; it doesn't smudge off or look dry and cracked. I'm so happy with it! My one slight negative is that I wish the applicator was bigger; it's quite a thin wand with a small doe-foot, so you kind of have to keep wiping it onto your skin to get a good amount of product on. I definitely wanted to try the Matte Bronzer in Blaze | £20.50 | so picked up the deeper of the two shades this comes in. This is a cream stick bronzer that has a matte, shimmer free formula - unfortunately it also came slightly damaged but I managed to hide it in my shot, I think... As it's a cream, I like to apply this directly over foundation and concealer, as opposed to on top of powder to get that smoothness and blendability. You can swipe the product directly on the skin, but if you want to warm it up a little then fingers work best. I personally like to dab a synthetic brush onto the surface of the stick and apply to my face with a stippling motion. It gives a natural dimension to the skin and warms things up very subtly. 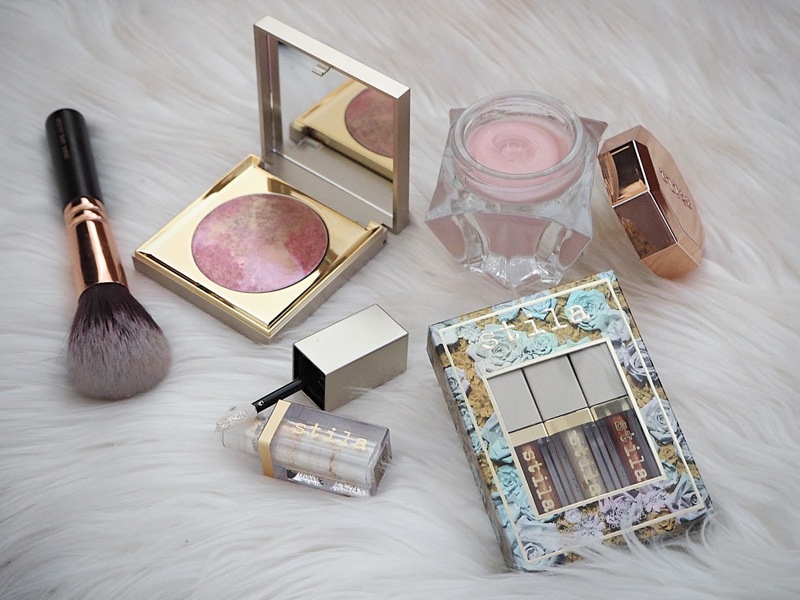 What I also like is that it doesn't have an overly 'shiny' finish like some cream bronzers I've tried, so it wears well on my skin and doesn't disappear during the day. In the little set I have a mini of the Lip + Cheek in Werk | £20.50. The reason I didn't pick this up to begin with was because I rarely have much luck with these sorts of products for both of their uses and the packaging is just too bulky (it's the same size as the bronzer and primer) for me to throw in my bag and touch up my lips during the day. I'll say right off the bat that this has a sheer, almost gel-look formula, so will definitely be best for dry skin when used on the cheeks. Although it does go on really nicely, looking fresh and dewy, it just doesn't last on my cheeks, as I'm more on the combination side. This is a pretty rosy lip colour that's hydrating and adds a natural flush of colour, but it just doesn't seem practical for me to buy the big version of this for that use. A product I'm so glad was in the set is the Kush High-Volume Mascara | £20.50. I actually wasn't hugely interested in this product so would never have given this a go otherwise, however I really like it! I'm not a huge fan of the current trend of cannabis-inspired beauty products - not from any moral high-ground on what educated adults decide to put in their bodies, but just because it seems a little bit 'try-hard edgy'. I think that's probably what put me off this initially! This is a mascara with a large fibre wand and it gives me amazing volume and length. My lashes look so fluttery and entirely free from clumps! It just gives a fullness to them in a way that looks very natural. It doesn't flake or smudge much on me and gives my lashes such great curl and lift. I would definitely pick up the full-sized tube of this mascara. Finally we have the Eye Pigment in Gig | £20.50. 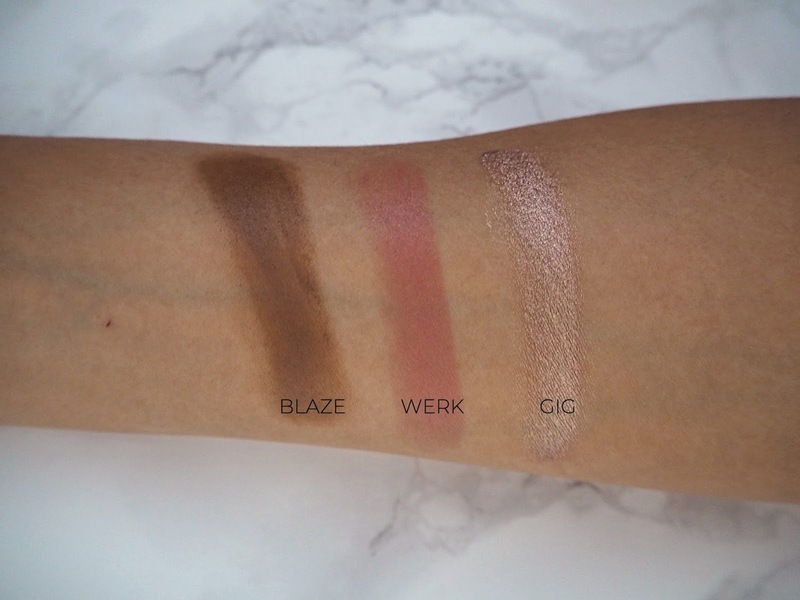 I'm a total sucker for liquid / cream eyeshadow formulas and Milk have this collection of bright, neutral and smoky shades that come in squeezy tubes. There's definitely a bit of a learning curve with this product, as you don't need to use much of it at all. It's very easy to get this to full opacity or even sheer it out for a glossy eye look if you want. Once applied, you get quite a lot of playtime to move the product around before it sets in place (so be careful it doesn't transfer). All of these shades are shimmers and Gig has a gorgeous glitter-free metallic pearly finish. This wears really well on me, keeping that beautiful finish all day, and it doesn't crease! Gig is a very wearable cool-toned bronze brown. 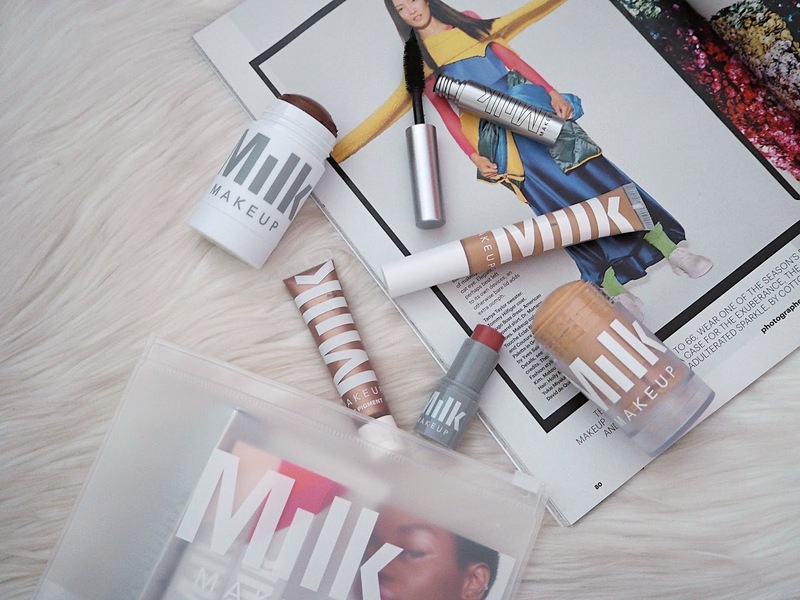 Have you tried Milk Makeup? If not - are any of their products on your wish list?